What happens to my food storage when I file bankruptcy? Here in Utah, many, many people have a fairly good 3 month supply or even year supply of food, water, and essentials. Emergency preparedness, food storage, and the like have been preached from the pulpits for Utah congregations for the last 100 years or more. When you file bankruptcy, it is the bankruptcy trustee’s job to see if you have an non-exempt (unprotected) assets that he can sell off and use to pay your creditors. Your food storage (up to a year’s worth of provisions) is 100% protected. 78B-5-505. Property exempt from execution. So you can safely start canning with no danger of losing your family’s necessities. You can shop the case-lot sales without fear. This is especially important during tax refund season, because I have counseled all of my clients to spend their tax refund monies on food storage. It never hurts to have a supply of canned goods, frozen chicken, and extra cereal boxes. 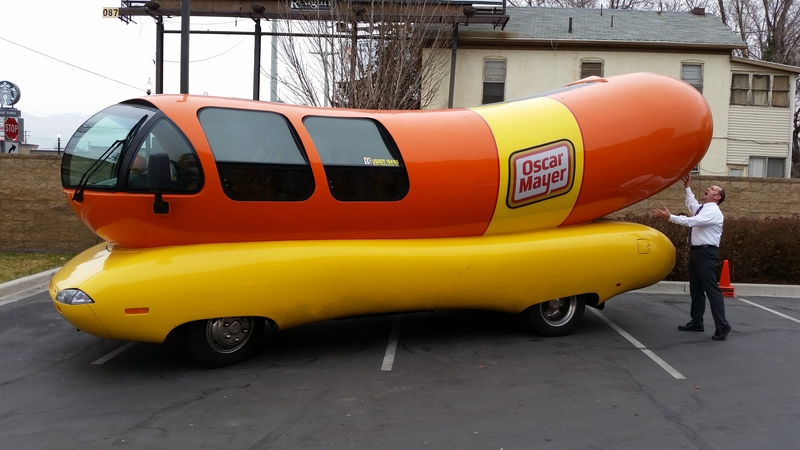 As for my family, not only would this hot dog be exempt in bankruptcy, but I believe that it would feed us for months in an emergency. This entry was posted in Utah Bankruptcy on January 30, 2015 by robertspaynelaw. 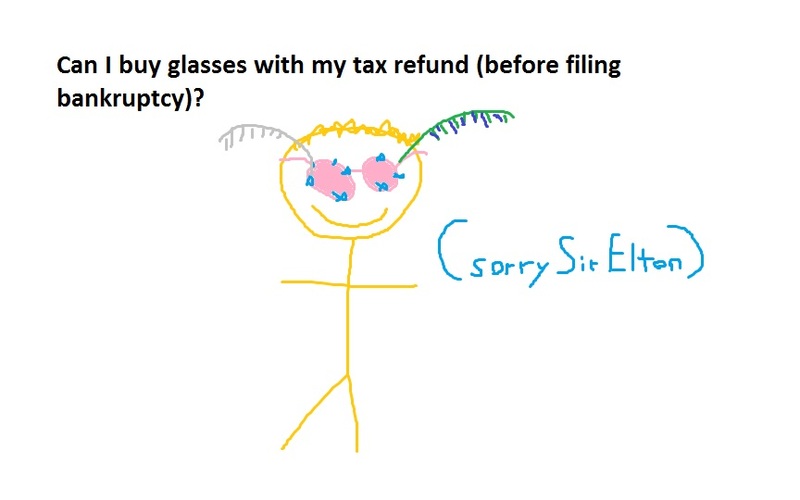 Can I buy glasses with my tax refund (before filing bankruptcy)? 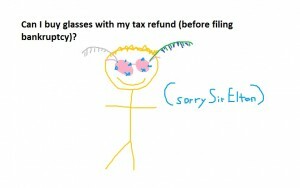 You normally want to receive and spend your tax refund prior to filing bankruptcy. The problem is that you sometimes buy things that the trustee can take and liquidate. For instance, if you buy a $3,000 atv, you will lose it two weeks later when you file bankruptcy. However, glasses are a safe purchase. They are considered “health aids” under Utah law, and are completely exempt (protected) from your creditors, including the bankruptcy trustee. In theory, if you don’t need glasses, then they wouldn’t be protected. Additionally, there is always a rule of reason: $10,000 diamond studded solid gold glasses are probably beyond the scope of the health aids exemption. In other words, Elton John may have a problem, but you should be okay. This entry was posted in Utah Bankruptcy on January 29, 2015 by robertspaynelaw. 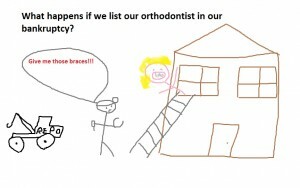 What happens if we list our orthodontist in our bankruptcy? It is easy to list medical bills in a bankruptcy and discharge those financial obligations. My most common case involves a huge medical bill from one hospital stay that overwhelmed my clients and forced them into bankruptcy. However, an orthodontist is kind of a special creature: we want to keep using his services for the next couple of years. If you list him in the bk and wipe our your debts to him, he will refuse to see you and continue to work on your braces. So, what we do is list him in the bk, but you can always voluntarily pay him after we file and keep seeing him. 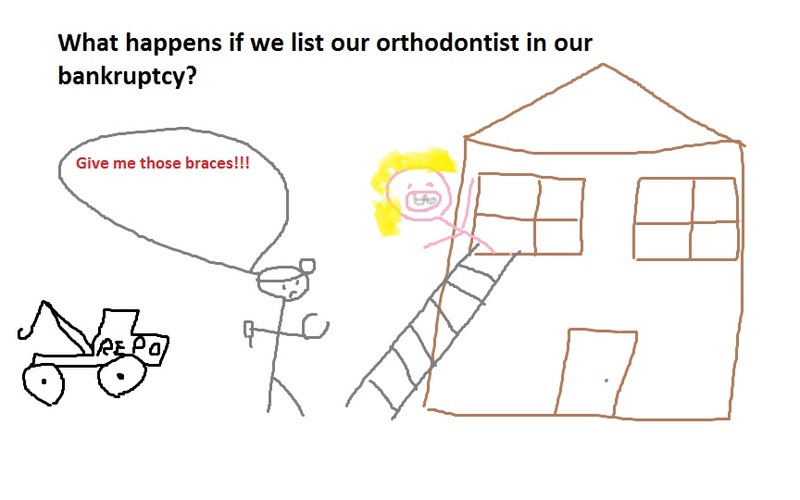 Yesterday I met with a nice orthodontist at Utah Orthodontic Care. My daughter’s braces will be on for about 2 years, and I’ll be making payments to the orthodontist’s office for about 2 years as well. If I filed bankruptcy, I could cancel that long-term payment contract, but I know that he wouldn’t tighten my daughter’s braces, or give her check-ups, or fix broken brackets, etc. I can’t make him work for free, so even if I filed bankruptcy, I’d still plan on paying him back. On a side note, those braces are not a secured debt, like a car or a home. If you go bankrupt, he won’t come to your home and repossess them at night time. This entry was posted in Utah Bankruptcy on January 28, 2015 by robertspaynelaw. My old law firm had a book in the waiting room that listed 100 famous people who had filed bankruptcy and came back from it. Bankruptcy is awful, but it gets you to zero and lets you get on with your life, giving you a fresh start. 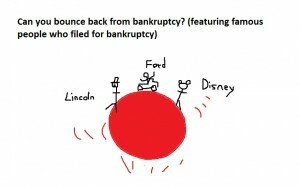 I was reading an article called “10 Famous People Who Went Bankrupt But Made It Again,” in MoneyReign.com, and it’s always fascinating that bankruptcy can happen to almost anyone, and literally anyone can recover from it. Abraham Lincoln filed bankruptcy in 1833 because of a failed business venture. He still did okay! Mark Twain filed bankruptcy after losing most of his money because of a single bad investment. Larry King filed bankruptcy twice in his life, with his personal debts over $352,000 for his second filing in 1978. Even Walt Disney filed in 1920. His creation of Mickey Mouse in 1928 sure turned things around for him. 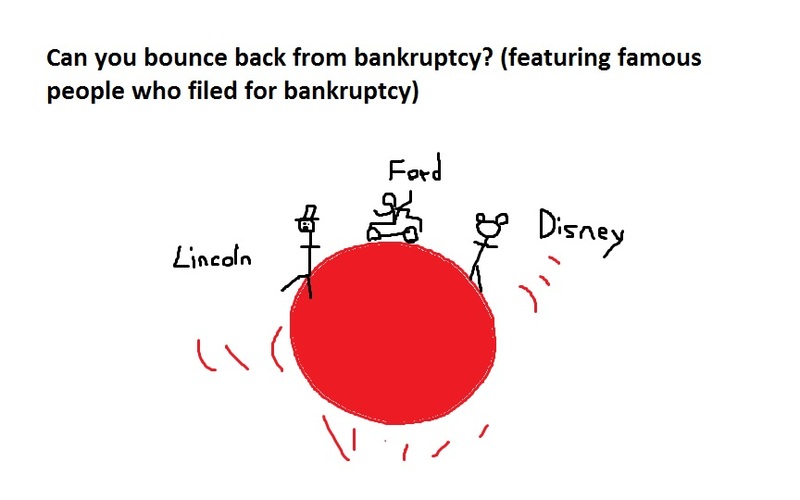 Henry Ford filed bankruptcy after his first two companies failed. His third company is still around. I will skip the actors and singers from the article, but it really can happen to anyone. To add a Utah flair (even though Joseph Smith never made it to Utah in person), because even Joseph Smith and Hyrum Smith were forced into it by some fairly nasty creditors. They filed their bankruptcy cases on April 18, 1842, with Joseph listing $78,066.38 in creditors. The events leading up to bankruptcy are awful and heart-wrenching, but bankruptcy itself isn’t that bad. After you file, you feel like a million pound weight has been lifted off of your shoulders. It really does offer a fresh start. This entry was posted in Utah Bankruptcy on January 27, 2015 by robertspaynelaw. What are the FHA, VA, USDA, Conventional, and Jumbo Mortgage guidelines for getting a mortgage after bankruptcy (short sale or foreclosure)? Not as bad as you think. It will be anywhere from one year of payments in a chapter 13 case, up to seven years. 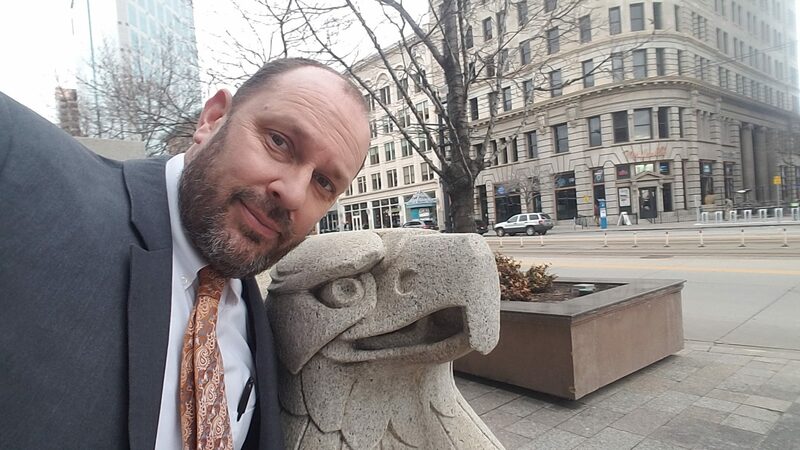 I normally tell clients that it will be 2 years and 4 months after their chapter 7 case filing before they can buy a home after bankruptcy (2 year wait plus the four months it takes for your case to discharge). Foreclosure – You may apply for a FHA insured loan THREE (3) years after the sale/deed transfer date. Short Sale / Deed in Lieu – You may apply for a FHA insured loan THREE (3) years after the sale date of your foreclosure. 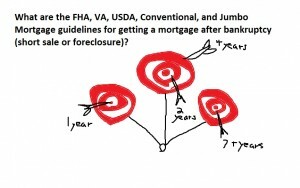 FHA treats a short sale the same as a Foreclosure for now. Bankruptcy Ch 13 – If you have finished making all payments satisfactorily, the lender may conclude that you have reestablished satisfactory credit. If you have satisfactorily made at least 12 months worth of the payments and the Trustee or the Bankruptcy Judge approves of the new credit, the lender may give favorable consideration. Short Sale / Deed in Lieu of Foreclosure – If you had big issues the deed in lieu of foreclosure will be viewed as a foreclosure and you would want to wait no less than 3 years if the score is under 640. Over 640 your UW will make the call but typically not less than one year. UPDATED 12/2014 – Mortgage debt included in Bankruptcy will go by BK discharge date, and subsequent foreclosure, short sale, or deed in lieu of foreclosure will not count as an additional waiting period, as long as you are off title for any defaulted mortgages. Although I have not personally processed a USDA with a short sale under 3 years, I have heard of instances when it is possible to buy again with re-established credit in as little as 18 months.In some cases there is not a waiting period. If the credit was perfect and they had to move because of a relocation or something and had no choice but to ask for a deed in lieu of foreclosure you would be ok. UPDATED – Effective 7/29/2014: Waiting period for subsequent foreclosure that was included in Bankruptcy is waived. If mortgage is included in Bankruptcy, waiting period defaults to FOUR (4) from the discharge date. UPDATED – Effective 8/16/2014: Short Sale or Deed in Lieu of Foreclosure not included in a Bankruptcy has a new Waiting Period of FOUR (4) years from date your name is removed from title. This replaces the ability to buy in 24 months with 20% down payment and minimum 680 credit score. Currently treated the same as a foreclosure with a waiting time of SEVEN (7) years before you can buy again using a Fannie Mae conventional home loan. Credit must be re-established with a minimum 620 credit score. Fannie Mae has reduced waiting periods in cases of extenuating circumstances – The death of a primary wage earner seems to be the only one I have been able to identify up to this point. Bankruptcy – You may apply for a Jumbo mortgage loan once any chapter of bankruptcy has been discharged for FOUR (4) years, FIVE (5) years if multiple bankruptcy occurs on credit profile. NOTE: If hardship is the result of an extenuating circumstance, waiting periods may be reduced. Contact lender for details. Again, this is Scott Schang’s work, and if you want to thank him, go to the original article. This entry was posted in Utah Bankruptcy on January 26, 2015 by robertspaynelaw. 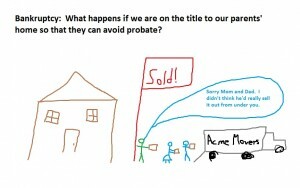 Bankruptcy: What happens if we are on the title to our parents’ home so that they can avoid probate? Worst case scenario: Mom and Dad have to sell their home or take out a huge HELOC (Home Equity Line of Credit) to pay off your bankruptcy trustee. Best case scenario: The bankruptcy trustee acknowledges that you are not owners, never contributed to the mortgage or property tax payments, and lets it slide. On the day you file bankruptcy, your bankruptcy estate is created. The estate is comprised of everything you own, your cars, your home, your bank accounts, etc. The bankruptcy trustee looks at the value of your bankruptcy estate, minus any exemptions claimed, and determines whether or not he can sell off anything to pay some return to your creditors. 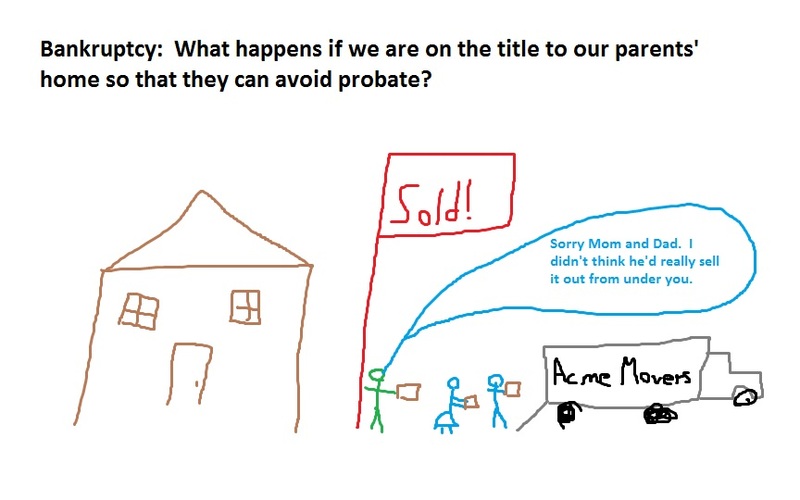 If your parents have put you on the title to their home to “avoid probate,” then you are now partial owners of the home. You may own 50% of the home (depending on how they structured it). If you are the 50% owner of a home with equity, this is equity the bankruptcy trustee might want to sell off and use to pay your creditors. Hopefully, you can explain that you were never really an owner of the home and have no real equity in the property, but it’s a tough argument. Even better, if the home is mortgaged to the hilt, then there’s no equity, and it’s a non-issue. Unfortunately, if the trustee finds that you do have equity in the home, he can demand that you pay the equity to him. If you cannot, he can sell the home, give your parents their half of the equity, and use the other half for creditors. And no, it’s not safe just to quit-claim your interest back to Mom and Dad right before you file. That is even worse! Talk to a bankruptcy attorney before you do anything here. This entry was posted in Utah Bankruptcy on January 23, 2015 by robertspaynelaw. 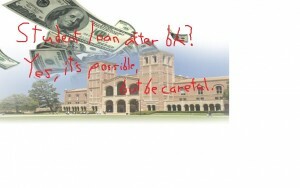 “Keep in mind that a private lender may have different lending criteria than a lender issuing a government insured student loan,” Hook said. In other words, there are no legal prohibitions against a lender giving you a student loan (or many student loans) with a bankruptcy on your credit report. On May 19, 2014, I wrote about this topic on this blog. Does bankruptcy affect my ability to get new student loans?, with the same answer. This entry was posted in Utah Bankruptcy on January 22, 2015 by robertspaynelaw. 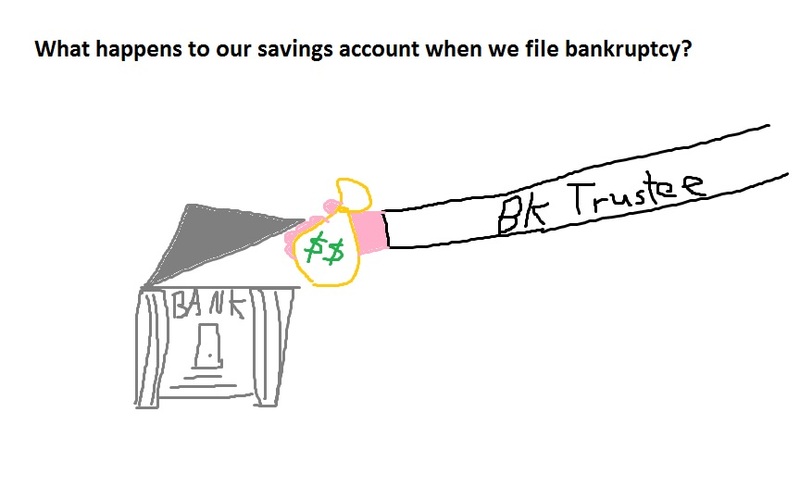 What happens to our savings account when we file bankruptcy? Technically, you don’t lose it, but any money in the account needs to be paid to your creditors. 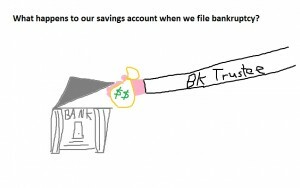 If is is a negligible amount, like $200, then you’re probably safe, but if you have built up a healthy savings account, the trustee will demand that you pay it to your creditors. (This does not apply to retirement accounts like pensions and 401ks. Those are generally safe). You are going to argue that it makes sense for you to have a savings for a rainy day, but this argument will fall on deaf ears with the trustee. It is the bankruptcy trustee’s job to uncover any assets you own which can be used to pay some kind of return to your creditors. So, in a chapter 7, the bankruptcy trustee will order you to turn over those funds so that he may distribute them equally among all of your creditors who file claims. In a chapter 13, you will need to pay that dollar amount to your creditors over a 60 month plan. So in bankruptcy we can protect $3,000 of equity in a car for husband and another $3,000 for wife. This means that if we filed a simple chapter 7 case, we would lose one vehicle. So, instead, we file a chapter 13 where we file a plan with the court to protect our vehicles and wipe out the unsecured creditors. Our base payment is $0.00 a month for 60 months to wipe out regular creditors like credit cards and medical bills. However, we need to protect the Explorer. It is worth about $6,000, so we would offer to pay $6,000 back to our creditors total over a 60 month plan. This makes the base payment $100 a month. $160 a month … The trustee charges about $1,000 to administer the case, and the attorney is awarded $3,250 in fees, so this raises our base payment to about $160 a month. We have $8,000 in savings. If we spend all of this before filing (like paying down the mortgage), then it is not an issue. Otherwise, we have to contribute this to the plan. $290 a month… If we keep the $8,000 in savings, we have to pay another $8,000 to our creditors, and our plan payment jumps by $130 a month, up to about $290 a month. $200 a month… Let’s say that you pay the entire $3,250 in attorney’s fees before we file the case, then you only have $5,000 left in savings, plus $6,000 in the Explorer, and $1,000 to the trustee. Your payment drops to $200 a month. $110 a month… Let’s say you pay the attorney’s fees of $3,250 before filing, and pay $5,000 towards your mortgage, then you only have $6k Explorer and $1k trustee, and your plan payment is about $110 a month for 60 months. This entry was posted in Utah Bankruptcy on January 21, 2015 by robertspaynelaw. 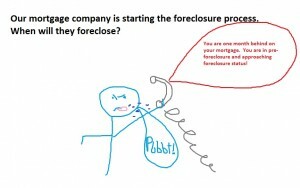 Our mortgage company is starting the foreclosure process. When will they foreclose? Pbbbt! Not for a long time (2-6 months or more). 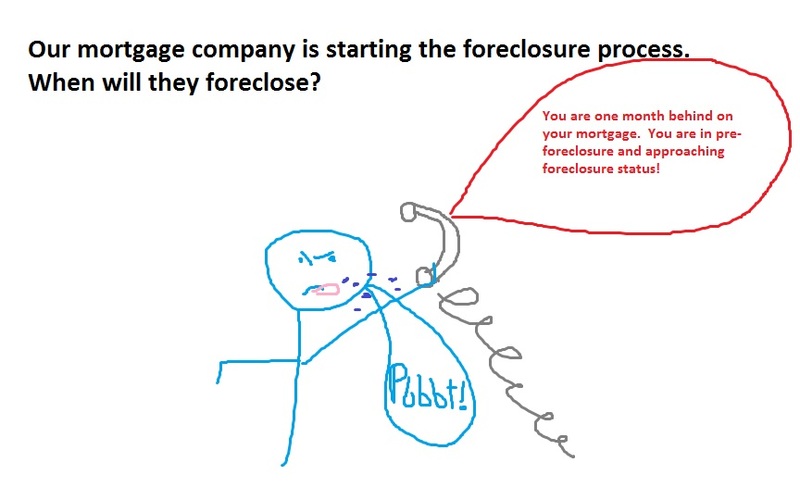 If I had a dime for every time a client thought they were going to lose the home in the next week because a collector or letter said that they were in pre-foreclosure or going into foreclosure, I would be able to buy a nice stack of Little Caesar’s pizzas for the family tonight. Normally, this is how it works in Utah. 1. Miss 2 mortgage payments. 2. Receive a Notice of Default that says you are in default of your mortgage and the bank will start foreclosure proceedings. 3. Miss another 4 mortgage payments (or more). Note that you’ve now missed 6 mortgage payments, over the last 6 months. 4. Receive a Notice of Foreclosure or Notice of Trustee’s Sale (which will happen 30 days from now). This is a long, long process. You can normally miss about 6 mortgage payments before you even get a foreclosure sale notice. Bankruptcy can definitely stop this at any point in the process. This entry was posted in Utah Bankruptcy on January 19, 2015 by robertspaynelaw.